So you’re thinking about adding sound to where you really like to spend a nice day – outdoors on your patio, deck or maybe by the pool – but you’re not quite sure what you’re getting into. Well, allow us to lend a hand. You’ve probably noticed how awful most outdoor speakers sound. Maybe even thought something like “Geez, I guess that’s just the price to be paid for outdoor sound”. Well, it simply doesn’t need to be that way. 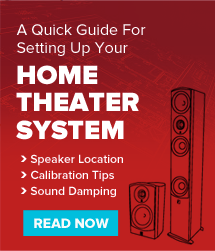 The problem is that outdoor speaker placement requires a very different sound balance to produce the natural sound you’re used to indoors, especially with regard to the bass level. Without nearby walls to contain omni-directional bass waves your music ends up sounding bass-shy and tinny. The solution is to tune the sound specifically for outdoor use. Done properly, this requires a bass adjustment switch to allow your speaker to be adapted to its proximity to outdoor walls. Of course, in order to equalize a bass boost into a speaker, it needs to have bass potential in the first place. Turns out that good bass is an engineering trade off for efficiency and enclosure size. If these speakers are of a sensible size, they will need to have modest efficiency, at best, in order to allow for the bass levels needed for high quality outdoor sound reproduction. Meaning that they will need to have decent power handling to play loud enough to permit moderate sound levels even if on the other side of your yard. Another consideration is if the speaker has the means to be positioned where you want them to go and where they have a chance of sounding good. Can they be aimed into the listening area? Are they easy to mount? Can you live with their size and appearance? Are there color choices? And lastly but most obviously, you’ll want an outdoor speaker designed to survive the great outdoors for years. It needs to be made of materials meant to take what Mother Nature can dish out – materials like UV resistant plastics, butyl rubber, non-corroding metals, fiberglass, powder coated surfaces and adhesives that can withstand the elements. Where your outdoor speakers end up will play a large role with both their sound quality and how well they’ll be protected from the elements. Fortunately, what’s good for one is usually good for the other. To get the best bass and loudness potential, you’ll want to position your speakers with their backs against a wall. Any room boundary, such as the “ceiling” shown here, will help. Separating your speakers so that they are about as far apart as they are from the listener is ideal for the best stereo effect… but only if you’re positioned in the sweet spot half way between the two speakers. If you’re going to be anywhere else, consider moving the speakers closer together so that you don’t end up hearing the piano but missing the guitar. Most of the better outdoor speakers are aimable and will adequately cover a range of about 60° – 70° (30° – 35° off axis) with a little better sound off to the side if they are mounted vertically. Improve your outdoor living by bringing your favorite music with you. With a little bit of information guiding you in the right direction, your backyard, patio or pool area can have a soundtrack that will last a lifetime. Enjoy! This has been a useful read, as my husband and I are revamping our outdoor patio area, specifically for entertaining purposes and the hints and tips on how to’s really helped us to consider a lot of things, especially regarding our outdoor electronics. We initially saw a few reviews on outdoor speakers and decided on the Klipsch AW-650, as we thought that mounted speakers would be a great and low maintenance fit, and it seems to fit in well with everything mentioned in your article as well. Naturally since the speakers will be semi-outdoors, we would like something that will be durable enough to withstand all sorts of weather conditions, hence the research that we’re doing now. We don’t want something we have to replace every 12 months! The Klipsch seemed like a good fit. However I came across outdoor rock speakers, and naturally I liked their aesthetics a lot more. However I am not sure about their durability and sound quality. We would still like to hear the music when the kids are going bonkers at the pool – Will these rock speakers be able to do the job, in comparison to the mounted Klipsch speakers? Can anyone perhaps give me some first hand accounts about these speakers?